Why is it that I don’t like meat, but I can handle meatballs? Maybe because it doesn’t resemble actual meat? Most people, both kids and adults, like meatballs. I have made many meatball-related recipes in my classes, and they are always quick favorites. I grew up thinking a meatball was only something simmered in a marinara (tomato) sauce and served with pasta. And it usually is, but there are Mexican-flavored meatballs in albondigas soup, sweet and sour meatballs, Swedish meatballs and Greek meatballs, so why can’t there be Asian-flavored meatballs? Indeed there can be. 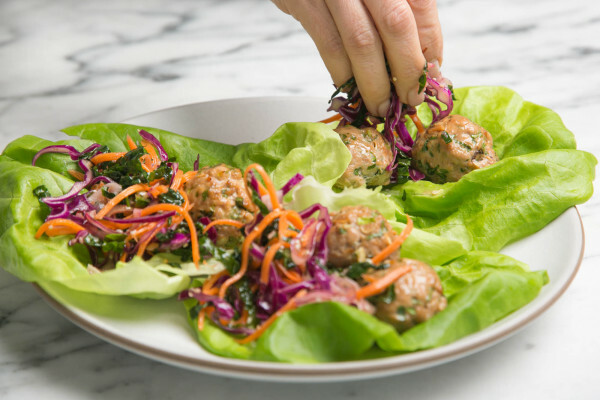 When I came up with this recipe, they didn’t go into a soup or in a rice and veggie bowl, although those would be great ways to enjoy the meatballs. I served them taco-style, in a big lettuce leaf with crunchy cabbage and a spicy sauce. My family went nuts and the mamas in my classes all ran home to make these for their kiddos. I received lots of great feedback, so I am confident you will receive rave reviews. One thing I was sensitive to with this recipe was being able to make a meatball without breadcrumbs. So many of my students need to cook gluten-free or grain-free at home and I wanted to accommodate their needs. 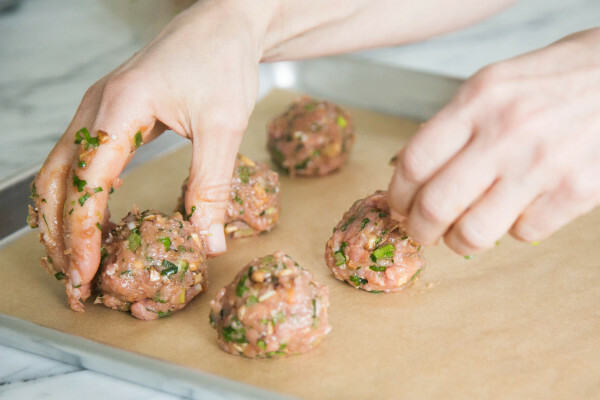 But it’s hard to make a meatball without the bread to lighten it up, especially when using turkey or chicken which has much less fat than beef. No one likes a tough meatball. So I used my Tasty Turkey Burger recipe as a guide and used tomato paste for flavor and moisture, as well as shiitake mushrooms which have a lot of water and meaty flavor. You will not see the mushrooms or taste them, so don’t get all worked up before even trying this recipe. Mr. Picky devours these meatballs and he wouldn’t eat a mushroom if I bribed him with a ticket to the Super Bowl. They just have a little soy-sesame undertone to them and that’s all. Some kind of sauce is key to making these a little more interesting, although you can certainly serve them on their own. I am obsessed with sriracha — a spicy, tangy chili sauce which is easy to find in the “International” aisle or Asian section of most supermarkets. It goes perfectly with anything creamy, like mayo or yogurt. I blended some into soy-free Vegenaise and wanted to dip everything in my refrigerator into it. You can adjust the heat in the sauce by using more or less sriracha. It’s just an option. A drizzle of a soy-based sauce would be a natural way to go as well. 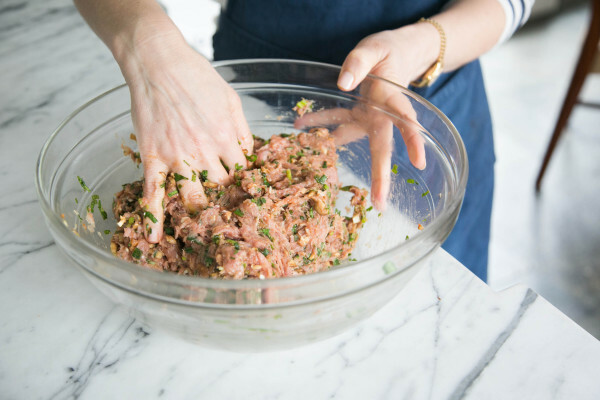 For your do-ahead prep, you can easily make this mixture the day before or the morning of and bake the meatballs later. I have a feeling the baked meatballs would freeze well. I’ve even eaten them cold out of the fridge in a salad and I though they were delicious! Preheat oven to 500 degrees. Line a baking sheet with unbleached parchment paper. 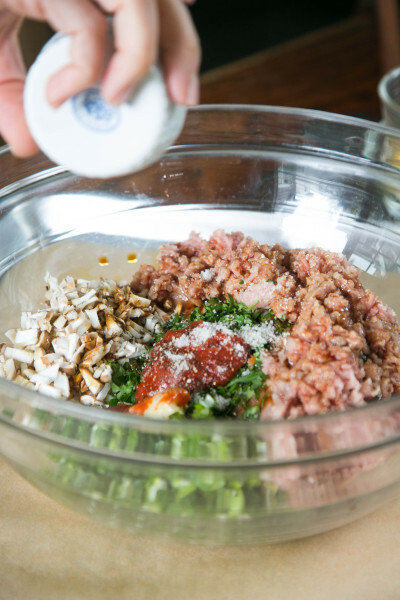 Form 2 Tablespoons of the meat mixture into a ball and place on prepared baking sheet. Repeat with remaining mixture. 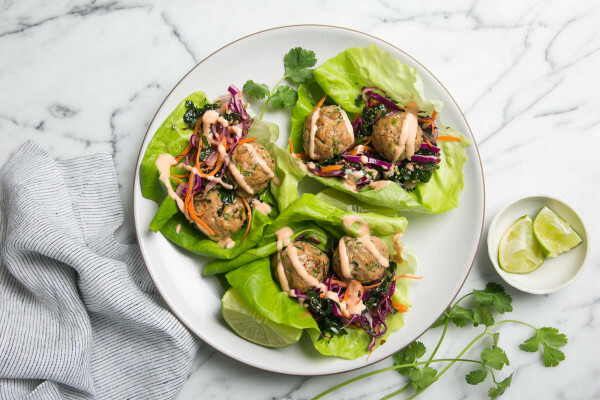 Serve with lettuce leaves and sriracha aioli* and avocado slices, if desired. Or see my other suggestions at the end of the blogpost. *Sriracha aioli: ½ cup Vegenaise + 2 Tablespoons sriracha + a pinch of salt. I have made these numerous times and love them! I also just made your Italian style meatballs last night – delicious! Curious about the greek style meatball you mentioned. I would love to stick with turkey and stay healthy – what herbs would you suggest for a Mediterranean vibe? Thanks Pamela!! I would do fresh parsley, garlic, dried oregano, maybe even a little lemon zest! These meatballs are delicious, Pamela! Thank you! I’d like to freeze the meatballs; should I bake them first and then freeze OR should I form the balls and freeze without baking? Hi Liz! I think you can freeze them either raw or cooked. 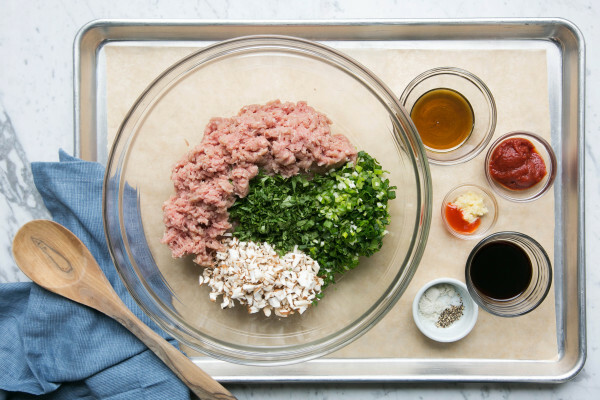 Cook the frozen raw meatballs as the recipe indicates, adding a little extra time. Not sure how much, you’ll have to wing it. 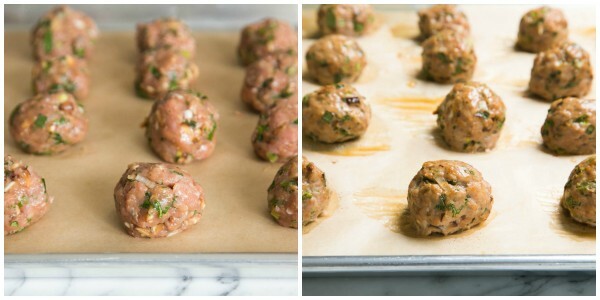 Reheat the frozen cooked meatballs in a 350 oven until warmed through. I have made the frozen uncooked version, slightly thawed while I wait for the oven to heat up, and they cooked beautifully. What is it about meatballs that everyone loves?! So true! Try them next with the sriracha sauce — yummers! I plan to use the sriracha sauce next time. My problem was finding one that did not have a bunch of stuff in it but I noticed you gave some recommendations. Thank you for those! We made these last night, and they were a big hit! We used Cholula for the aioli and it was very tasty. I chopped up some home grown sugar snaps and garnished the lettuce cups with them, plus shredded cabbage. We’re trying the drunken beans next. Perfect-o, Donita! So glad you enjoyed them. Can’t wait to hear what you think of the beans. I LOVE Cholula aioli!! Make it all the time. That would be amazing here, too! Made these last night and they were delicious! They got a but burnt so might flip them half way through next time. I didn’t have vegeniase so mixed sriracha with greek yogurt which was amazing! Great recipe for cleaning eating! What brand of sriracha do you use? I don’t want to end up with a “fake” one – lol! The most important thing to do is read the ingredient list and make sure there aren’t any scary ingredients. Everyone loves Huy Fong, but it contains preservatives. Yuck. I also like to buy glass jarred sriracha instead of plastic, but you may not have tons of options. Thai Kitchen makes a clean one in glass and I like the one by Organicville, although it’s in plastic. is the 500 degrees a typo? Not a typo. If your oven doesn’t go to 500, go as high as it does and adjust time. You want it that high so it can brown the meatballs and keep them juicy.